Social selling virgins haven’t yet dabbled in the pool, but there’s still time. Use these tips from LinkedIn Sales Solutions to break them out of their shells. Do you have people on your team that haven't spent any time with social selling -- either by choice or by circumstance? These social neophytes might be reluctant to jump in, fearing that their inexperience will hinder success. You've got true social selling virgins on your hands -- and you'll need to break them out of their celibate shell. Here is how you can serve as their wingman in the social selling pool. 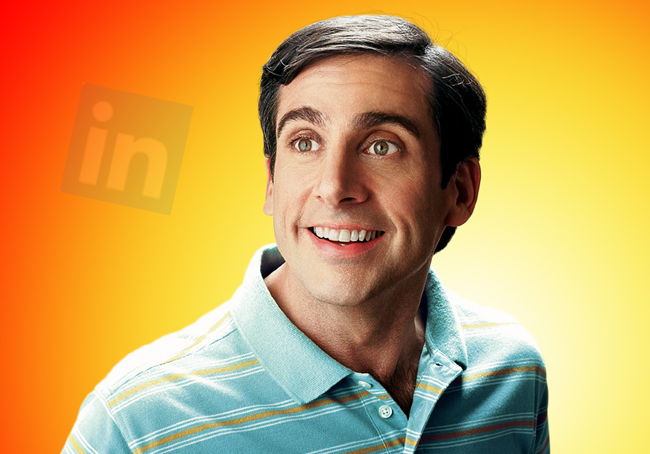 Steve Carell’s character in “The 40-Year-Old Virgin” is woefully undereducated on dating and companionship. He maintains a childlike living, surrounded by action figures. There are many reasons why people abstain from new technology, but those who ignore social selling are restricting their ability to connect with prospects. The first step is getting them out there. A good professional LinkedIn profile helps establish the initial connection. After undergoing many failed attempts to find a companion, Carrel’s character - Andy - eventually develops a genuine relationship with Trish, a store owner across the street. Andy and Trish bond over mutual interests giving him confidence as he enters unchartered territory. Thankfully, social selling doesn’t require extensive work to hone in on the ideal prospect connection. Targeted keywords, along with filtering tools like LinkedIn’s Advanced Search, allow members to dial down based on company size, function, seniority, and occupation. No need to wade through a long list of potential business matches – the right ones are within reach. After an initial attempt to reach the end goal, Andy and Trish instead decide to have more dates (20 more, in fact) to build the foundation of their relationship. Relationships are everything in social selling, and social selling newbies can work to develop them through consistent engagement and content sharing. Today’s prospects aren’t fond of the cold call – they prefer to have a warm introduction from a trusted source or thought leader. Engagement and trust are not the end goals of social selling – they are merely steps in the courting process. But for those new to social selling, the first steps are most important. You can help them get acquainted by showing key statistics on the benefits of selling socially. Our social selling newbies are not a lost cause – far from it! With a little help getting started and a masterful wingman to show them the ropes, social selling is sure to have them on prospect cloud 9 before you know it! Follow @LinkedInSelling for more insights on overcoming social selling virginity.